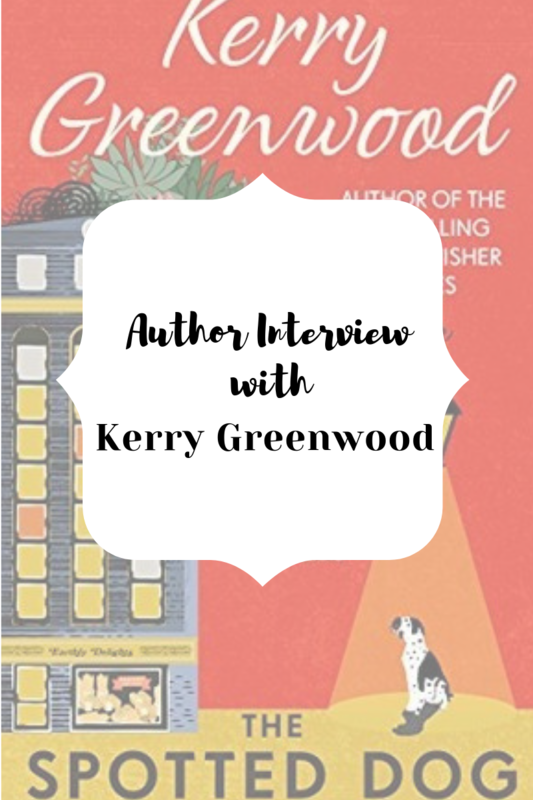 Yesterday I posted my review of The Spotted Dog, a delightful cozy mystery in Kerry Greenwood’s Corinna Chapman series. I am still slightly embarrassed that I never realised this was an Australian cozy mystery when I recommended it in my #5books posts. The book is number 7 thus far, and brings Corinna back after a long break. I did feel like I was missing out on details that came in the series before in terms of the relationships between characters, but the mystery, as Kerry Greenwood says below, new readers should not be confused. 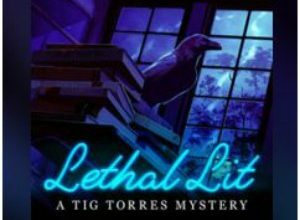 Read on to learn more about this lovely cozy mystery series! Having just discovered the Corinna Chapman series, I jumped straight into book 7 – do you think that was a wise thing to do for a newbie to the series? Or is it best to go back to the beginning of the series? It is probably better to read them in order but it isn’t essential. I make sure I set the scene properly in every book, so new readers shouldn’t be too confused. How would you describe Corinna’s journey over the past six books? A steady Quasi-Royal Progress. Slowly the world is learning. Do What The Nice Lady Says And No-one Gets Hurt. 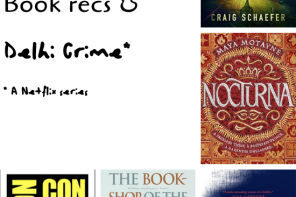 It’s been seven years since book 6 – what prompted the break? And what brought you back to Corinna? I had many other projects to begin, and finish. I have other series on the go, and I do not want to repeat myself. Many series writers begin to do this after a while and you think: hang on a minute? Haven’t I already READ that book? It is my proudest boast that all my books are different. I couldn’t leave her any longer! She has been waving to me from the rooftop garden for quite a while now. What inspired The Spotted Dog? I still cannot believe we got ourselves embroiled in Afghanistan. You’d think people might read Kipling and be warned off the idea. And I love dogs, even though I can’t have them at home because the cats would be mortally affronted. I know a senior army officer who is also a vet with a special interest in military dogs. There is also the pathos of animals being used in human wars. I recently visited the memorial to animals slain in war in Park Lane, London. It is moving, and poignant. What do you enjoy most about writing this series? In comparison or contrast to Miss Phryne Fisher series? I love the challenge of first-person narrative. It isn’t easy, because you have, as it were, only one hand-held camera. And while both women are role models and wish-fulfilment figures, Corinna is more like me. She gives me a chance to write about the present day. Ambassador Delenn (from Babylon 5) said that humans have a special gift for forming communities. We are a predominantly urban species now, but we still yearn for the verities of village life. I wanted to show the process of making comfortable village communities within megacities. Insula looks inward where possible, but always faces outwards to meet the challenges urban life throws at us. I want my readers to be comforted and consoled. Yes, life can be grim and horrible. We can acknowledge this, while showing the journey to warmth from cold, to love from hatred, to order from entropy, and from darkness to light. That is what my readers want. And they shall have it. I think she hits on exactly why I enjoy cozy mysteries so — they comfort and console me even if everything else is going crazy. They calm my mind when I’ve had enough of the darkness and need some light — without giving up any of my love for mysteries! It’s always interesting learning the inspiration behind a book or series! I’ve never thought about cozy mysteries like that, but huh, that makes a lot of sense. Great interview! Thank you! I am so excited finding another Aussie mystery! I’m going to have to check out this series. Sounds pretty unique. It is! I really did enjoy this one, and it left me wnating to know how Corinna got here, to this point.